(Bloomberg) -- If the Federal Reserve is indeed able to boost inflation, stocks with high pricing power should benefit, according to Goldman Sachs Group Inc.
Fed officials have talked about the potential for adopting an average inflation targeting approach. If they did so and tried to let price pressures mount, the odds of near-term rate hikes will probably decrease. That’s assuming it even works, as economists and central bankers have been overestimating inflation potential for years. 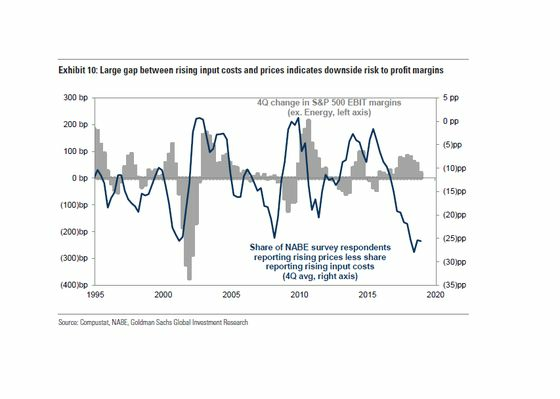 Such an outcome would be favorable to U.S. equities because of the more-dovish rate scenario, but likely less favorable for their earnings, Goldman strategists led by Ben Snider wrote in a note Friday. Snap-on Inc., Weatherford International Plc and National Oilwell Varco Inc. are among stocks with high pricing power that could fare well amid the Fed pivot, Goldman’s report said. Stocks that could fare worse include Alaska Air Group Inc., ICU Medical Inc. and GoDaddy Inc., the firm said.